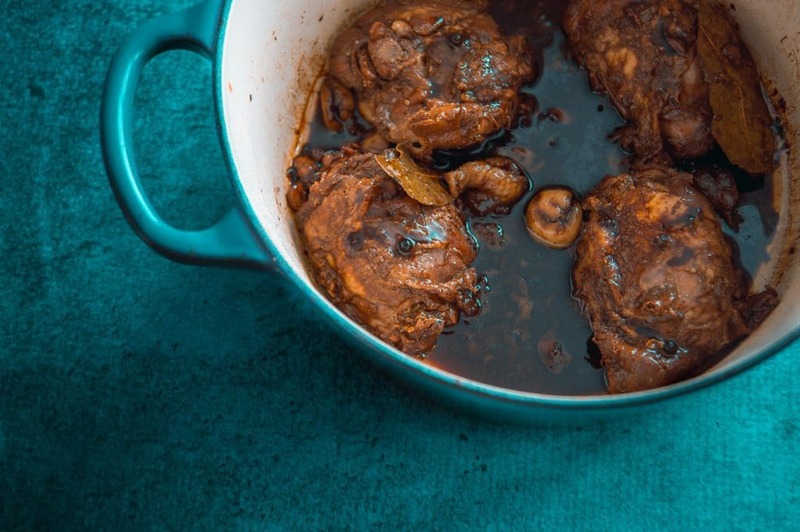 This super easy Filipino Chicken Adobo recipe is the one pot weeknight dinner you’ve been waiting for. 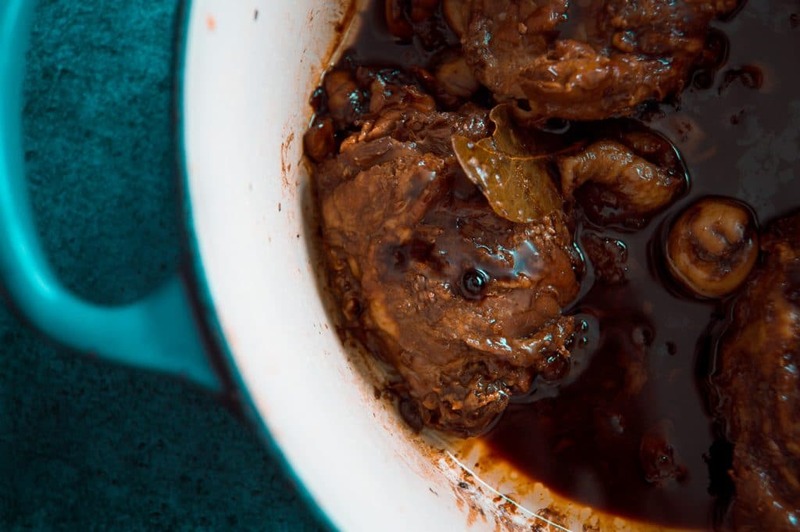 This chicken stewed in vinegar and soy sauce is one of the most popular dishes in the Philippines for good reason – it’s easy to make, doesn’t require any fancy ingredients, and is far more than just the sum of its humble parts. 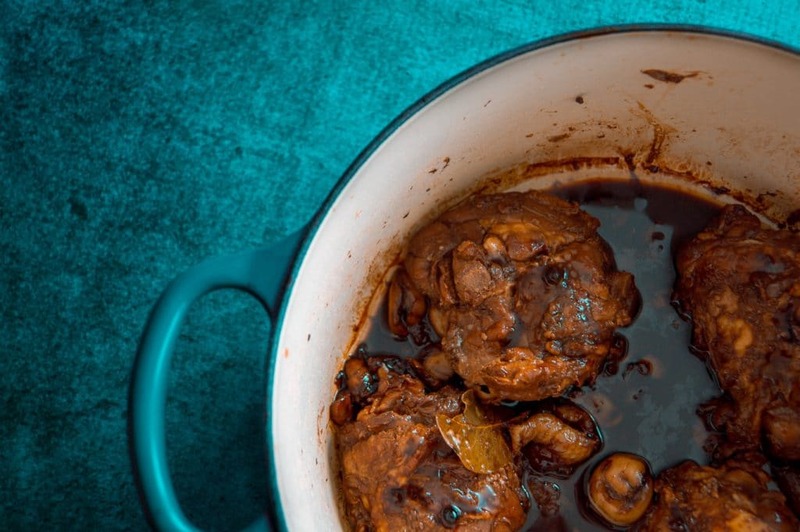 What is Filipino Chicken Adobo? Though there are variations of the basic formula (my version for example, includes a teensy bit of ground ginger and brown sugar), these five ingredients are the foundation of Filipino adobo cooking. The recipe below is a guide for how I do things at home, feel free to play around with the ingredient ratios to tailor to your own tastes! What does adobo actually mean? The word “adobo” translates to “marinade” or “sauce” so chicken adobo is just marinated chicken or chicken with sauce. It makes sense then that the result of adobo cooking is tender, fall-off-the-bone meat and a rich flavour. This super easy Filipino chicken adobo recipe tastes even better the day after it’s been cooked. Having extra time for all the flavour to come together does wonders. I’ve experimented with this a number of times now, and I have to say, it’s really quite versatile. Two Things You Should Know! 2. Typically, in the Philippines, cane vinegar or coconut vinegar are used. I tested this recipe using good ol’ regular, run of the mill, everyday from the store-kinda white vinegar. So unless you’re feeling fancy, you can use that too! Heads up, bestie! The link below is an affiliate link. That means that if you happen to purchase using the link below, I will receive a small commission at no extra cost to you. These small commissions help me keep the blog free, thank you. If you want to learn more about the adobo style of cooking, The Adobo Road Cookbook by Marvin Galputtos is a good place to start! That’s all for today, bestie! 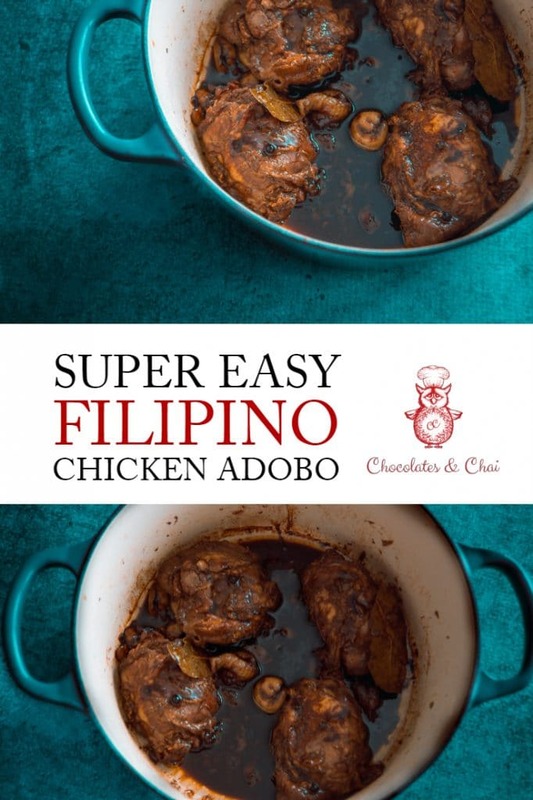 If you tried this super easy Filipino chicken adobo recipe, let me know what you thought in the comments below, and of any variations you made! Make sure to follow me on Facebook, Instagram, Pinterest, and Twitter to stay to updated on everything Chocolates & Chai. And feel free to sign up to my mailing list to become a part of The Besties Club. 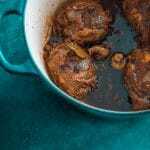 This super easy Filipino Chicken Adobo recipe is the one pot weeknight dinner you’ve been waiting for – easy, no fancy ingredients, and delicious! Place soy sauce, vinegar, garlic, peppercorns, bay leaves, ginger, and brown sugar into a large pan (I used a French oven). Add chicken thighs, skin side down. And turn the heat to high to bring the liquid to a boil. Cover, and let simmer over low heat for 20 minutes. Flip over the chicken, give it a quick baste, and then cover and simmer for a further 10 minutes. Uncover, return the sauce to a boil by bringing heat back to high. Occasionally baste and turn the chicken. Continue boiling for 5-7 minutes or until the sauce is reduced to the desired consistency. Enjoy! If you want to brown the chicken skin a little more, you can put it under the broiler for 3-4 minutes. Alternatively, a quick session with your blow torch will work too! It’s a much slower process, but I personally find that this recipe turns out even better if you marinade the chicken in the sauce for at least an hour or two (ideally, overnight) before you start cooking. Depending on your pot, and heat, it’s possible that your chicken might cook completely before the sauce has reduced enough. In this case, simply remove the chicken from the pot (use tongs, bestie…No burnt fingers today please!) and set aside until the sauce has reduced sufficiently. Thank you for passing by and commenting! I hope you enjoy the recipe! Looks and sounds yummy! Thanks for the recipe! Fabulous flavours in this recipe! I’m making it with boneless thighs because I have them on hand. Love how easy this recipe is! I made this tonight and we loved it. Super easy (as you said) and tons of flavour! Thanks for a great recipe. AHHH! Amazing. Thank you very much for trying out my recipe! I’m thrilled to hear you enjoyed it! Thanks Elaine! interesting. i was always taught that it should be a 1:to 1 ratio between vinegar and soy sauce or fish sauce. that way, there’s a balance of taste and not overly salty. so, it’s 1/2 cup soy sauce or fish sauce and 1/2 cup vinegar plus 1 and 1/2 cup of water. you don’t want adobo to be salty. Hey there! Thanks for commenting! So that’s the interesting about a lot of rustic/traditional recipes – there is often no exact way to do things (aside from a few basic points). 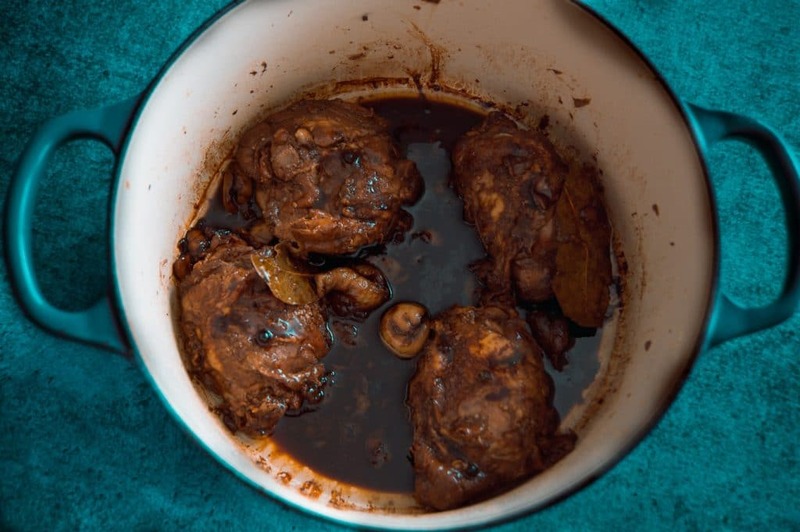 As far as I know, what makes this an adobo style recipe is the core ingredient set and the marination/stewing process…so it’s perfectly natural that you have been taught a different composition using the same ingredients. From my understanding (and I’m certainly no historian), there’s no set/official ratio that must be adhered to. The saltiness would be dependent on what type of soy sauce you use (I mentioned the differences between western and Filipino sauces in the post), as well as the potency of your other ingredients. Do you think this recipe could be doubled? It sounds great, but I would love to make it with 8 chicken thighs. Thanks! Thank you — I’m sure we will love it! Hi, thank you for this recipe. It was very tasty! I can understand that you are truly knowledgable about the foods you blog about. Continue up the very good writing! Hi there! Thank you so much for your lovely comment. I’m glad you enjoyed the recipe, and I hope you try out some more!